Repurposing content means to use the same content or topic but in a different format or in a different medium. Think of it like the aftermath of a big turkey dinner. Turkeys are such big birds, that after the main event you will inevitably have leftovers. That’s your chance to be creative with new turkey meals. Turkey salad, turkey wraps, turkey soup, turkey tetrazzini, turkey tacos, turkey curry. You get the idea. One bird gives you so many options. And now you’re thinking, what does turkey have to do with content marketing, Bonnie? 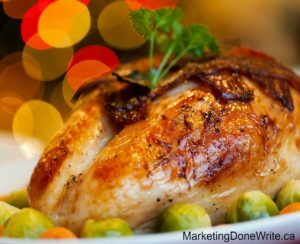 Consider how you can create content for your marketing by starting with a big turkey idea. Then start planning what your leftover pieces could be. Let’s say your big idea or topic is a blog post, or perhaps a webinar (the turkey). From that same content, you can repurpose the topic into all kinds of different content marketing media (leftover creations). I initially developed a 30-minute speech for a local networking group. From my speech, I later created a webinar, and I have created at least two blog posts from the same content. I have used social media campaigns for them all. Because we’re always looking for things to post on social sites, too, right? I had the webinar transcribed into text and am turning it into an ebook that I can use as a lead magnet or free gift. The webinar could be repurposed as a video to share. I could also create an infographic describing the main points and then link to blog posts for folks to get details. The lesson here is that I have many options to get this copywriting message to diverse audiences because I can share it on different platforms. And I’m just using the same content over and over. Coming up with new content all the time can be difficult and time-consuming. You have to define a topic, research it, write edit and proofread it, find supporting graphics, all of that. Maybe you need quotations or statistics, too. When you find ways to repurpose content you’ll make your life a whole lot easier. I’ll get to some examples in a minute, but first some benefits of repurposing your content. It may take a bit of time to put your content into a different format, but it should take way less time than creating content from scratch. By creating the same content in different media you can reach different audiences. For example, someone who likes to listen to podcasts may not like reading blogs. Turning your blog into a podcast can get you further exposure and build your credibility with different people. When you create content that is not time specific you should be able to reuse it again and again. That’s ever-green. For example, I have a blog post about planning your communications around tradeshows. I have posted it several times at different times of year, every year. By creating content in new ways you make it fresh and newly consumable by a varied audience. Instead of a just a blog post today, that topic could be posted again, or delivered in an ebook or other medium far into the future. If you place your repurposed content in different places, your brand will get more exposure. People will recognize it across different platforms and you’ll become more top of mind when a purchase decision is imminent. When you are planning a piece of content think about how you can also turn it into something else. Write a blog post. Easiest way to start, and you get immediate content to share. Create Social Media posts based on your blog content. There. Now you have social content, too. Create infographic. Especially great in a ‘how to’ or ‘statistical’ topic. Create a PowerPoint document. You can use it for Slideshare (if selling business 2 business – B2B). It’s now part of Linkedin, so you can access it there. PowerPoint slides for a webinar or speech. Bonus is you can get feedback in the chat of webinars, survey your listeners from your speeches, and have an opportunity to present an offer. Turn that PowerPoint into a video. You can record a voice-over in PowerPoint and then export the slides to a video format. The video can be loaded on YouTube but also embedded on your website, in places like Linkedin, and other social sites. Even consider a link in your email signature. Not ready for video or PowerPoint? Develop multiple blog posts for a series and then turn them into an ebook or small self-published print book. Turn the ebook into a downloadable pdf as a free gift or lead magnet. Repurposing existing content into various media is different than exactly duplicating your content by directly copying and pasting your blog post onto different platforms. Google doesn’t actually like duplicate content, and it’s all about Google, right? Being found in search results. The idea is to post the exact same content on say, your website, Linkedin, and a platform like Medium.com. Sounds like an easy thing to do to repurpose content, right? The challenge is that Google wouldn’t know which was the original, and therefore wouldn’t know how to index it, and therefore nobody would find it. The best way to duplicate content so that you can get good exposure is to ALWAYS post first on your website. That’s your property, your brand. Then wait a couple of days. That gives Google time to index the original. Then you could copy and paste your blog post on Linkedin, the whole blog and photo, but at the end you MUST provide a statement and link back to the original content on your site. “This post originally appeared on ‘your website’[link]”. Wait another couple of days and post on Medium.com. And be sure to link back to your original post. It’s important to follow these steps, otherwise your content will be duplicated for nothing. I hope you got ideas on how to extend your reach through different content platforms. It certainly does make it easier to get more exposure with the same content. When you prepare to write your next piece, think about turkey leftovers and all the fun things you can do to repurpose your main message on to multiple platforms. I’d love to know how you make out. Put your example or questions in the comments below. Good luck creating your repurposed content! PS – Are you struggling to create and implement a content repurposing plan? Book a free 15-minute Discovery Call, to see how I can help.